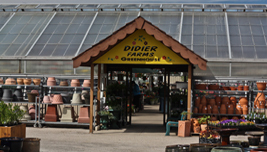 Didier Farms offers a variety of vegetables and flowers in our greenhouse this spring, and our farmstand in the summer. We also offer hayrides, pony rides, camel rides, an Animal Land, Pumpkin Play Area (NEW!) and our annual Halloween Pumpkinfest, every Fall in beautiful Lake County, Illinois.